Rashes or hives, also known as urticaria, can be a little scary, especially when you are not sure what caused it. There are many types of rashes, but typically a rash appears as raised bumps surrounded by red skin. It may start as a burning sensation that then develops into an itch or even skin welts. The great news is that if you treat it, you are likely to get rid of the discomfort of the rash fairly quickly. Interestingly, you can use a DIY diaper rash cream to treat it. 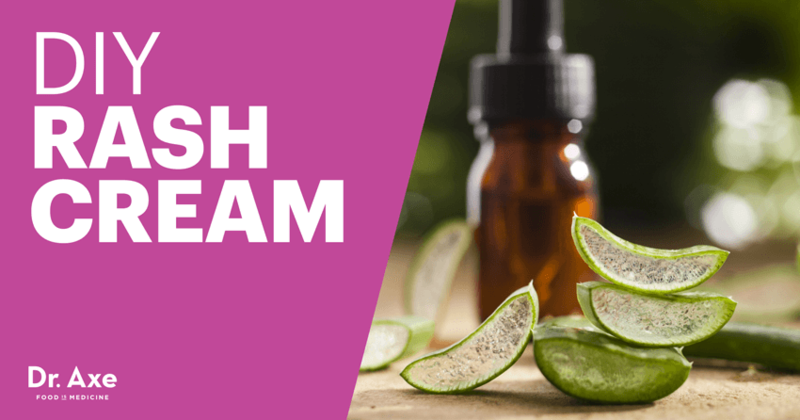 Another option is to make a special and easy DIY rash cream with natural ingredients right at home. Using a double-boiler (or you can use a heat-safe glass bowl that fits in a pan with a couple of inches of water), place the cocoa butter and grapeseed oil in the pan or bowl. Cocoa butter is an amazing ingredient because it has the natural ability to soothe irritated skin. Meanwhile, the debate about whether grapeseed oil is a healthy food is still out there, in regard to ingesting it. However, it’s great for your skin because of its vitamin E and moisturizing fatty acids. Rashes can cause drying of the skin and that makes grape seed oil a smart ingredient. Keeping the heat on low, gently melt the two ingredients while stirring. Next, add the aloe vera gel and blend well. Nature created a gem of a plant with the healing qualities of aloe vera, which dates back as far as 1935 with a study reporting the rapid relief from the itching and burning that aloe vera provides. Now, remove from heat and add the witch hazel, bentonite clay and lavender. Witch hazel acts as an astringent fighting bacteria while helping to reduce inflammation. Bentonite clay is phenomenal due to its ability to draw out impurities and toxins, which can really help the healing move along much faster. You will notice the mixture forming a paste as you add the bentonite clay. Continue stirring, adding the witch hazel to help achieve the desired consistency. It will produce a thick paste, like a mask, or you can make it thinner by adding a little purified water. Add the lavender essential oil, which is a favorite ingredient of mine because of the antimicrobial properties it contains. Place the mixture into a glass jar with a tight-fitting lid. This DIY rash cream serves another purpose, too. You can even use this as a mask on your face to help improve your skin and use as another great home remedy for acne. For your rash, simply apply a thin layer of your DIY rash cream to the affected area twice a day. Allow it to dry for about 15 minutes. Then rinse or gently wipe off with warm water. With this amazing rash cream, your rash is going to disappear in no time! Using a double boiler, place the cocoa butter and grapeseed oil in the pan and melt, while stirring on low. Next, add the aloe vera gel and continue to stir. Remove from heat and add the bentonite clay, witch hazel and lavender. Stir until well blended. Place into a glass jar with a tight-fitting lid. Apply to the skin twice a day, allowing it to dry for about 15 minutes. Gently rinse off with warm water and a washcloth.